It’s always interesting to revisit a place which I designed. In fact to say ‘I designed’ is over-egging it a bit. Usually people get me in to give them a bit of basic advice and then take the detailed design forward themselves. Those first, broad-bushsroke decisions are the really important ones, and often the most baffling for a new occupant. Dan and Maria’s smallholding is one such place. I revisited last week, two and a half years after my initial visit, when I walked round with Dan and gave him some advice. The land is all very steep. At the bottom, in the most sheltered position, was a field mostly of grass and a little less steep than the others. This is the area I suggested for the vegetable garden. It’s sheltered but well ventilated and the soil is good. Their neighbour has a digger and he made short work of terracing it for vegetable production. I strongly urged Dan that they should pitch their yurt in the corner of this field. This is the permaculture principle of zoning: put the element which needs most attention right outside the back door. 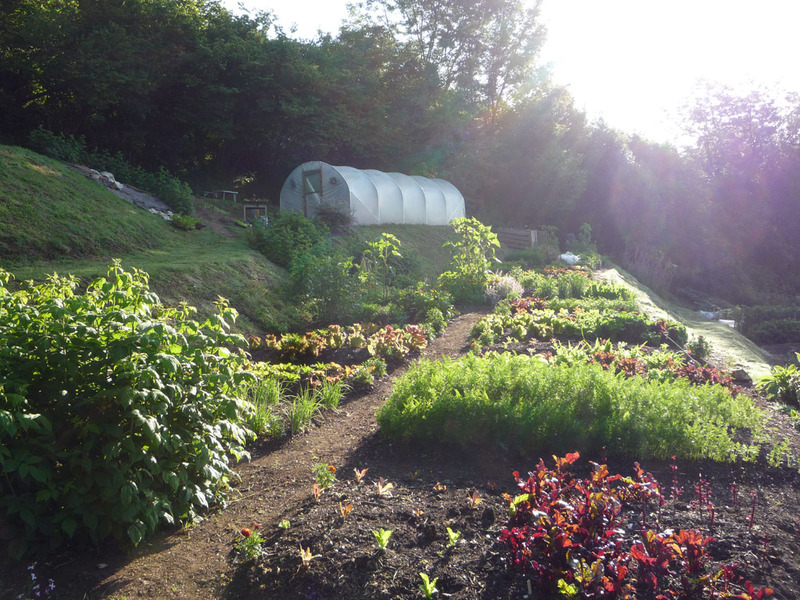 In all my experience of permaculture design this is the most powerful design decision that can be made and Maria and Dan’s experience has bourne it out. “Living right beside the vegeteables is incredibly important,” said Dan. “You can talk about the importance of compost and getting the soil right and it’s true, but the energy of being right there and giving the plants all that that attention is even more important, especially if you’re doing it for a living.” And I must say the truth of it is there to see in the quality of their garden, full of abundant, healthy plants and not a thing out of place. They make a living on a very small area, selling salad and other veg to local markets and restaurants. On my first visit, one of the steeper fields, higher up was partly grass and partly bracken and bramble. I suggested this would be the place for the orchard they planned, and to plant the trees on the bracken area rather than the grass as it makes a better companion for young trees. This they have done and the growth of the young fruit trees is impressive. Dan is cutting down the bramble and bracken regularly, with the intention that the grass should eventually recolonise. This involves cutting several times a year and I was deeply impressed by the amount of work he’s putting in. The third field was totally overgrown with brambles, bracken and gorse. Here I suggested a timber and firewood plantation, and they’ve planted 16 species of trees and shrubs to give a wide variety of produce in the future. (Hazel, sweet chestnut, hornbeam, black locust, oak, silver birch, small leaved lime, field maple, rowan, wild cherry, crab apple, hawthorn, guelder rose, spindle, alder buckthorn and common dogwood.) Here too Dan is cutting back the regrowth regularly, though perhaps more often than necessary in my opinion. Once young trees get their heads above bracken and gorse they invariably win the competition and shade out the lower-growing plants. “We really appreciate having the use of this land,” said Dan. “We once lived on some land that wasn’t being looked after properly and we resolved that if we ever got out own we really would look after it well.” Now they’re doing just that. 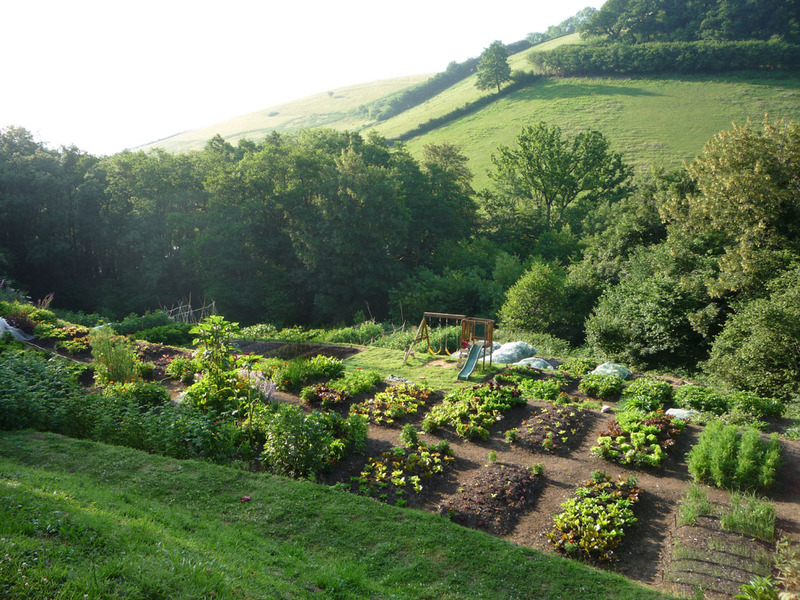 Their smallholding is both productive and brimming with wildlife, with soil well conserved and everything in its place. It’s always a satisfying experience for me to see people making a go of a smallholding. I know just how much hard work and how much skill goes into it and I take my hat off to them. In this case it’s also satisfying to know that I played some part in bringing it all about.